Following an accident, Aqualad is trying to regain his mental powers which have deserted him due, Aquaman suspects, to some sort of mental block. While exercising his powers, they come across Manhunters using modified jellyfish as submarines, jellyfish that attack the heroes. Recovering, they discover the Manhunters attempting to recover a spaceship from the sea bed and attack them before the Manhunters unleash special androids modified for underwater attack. 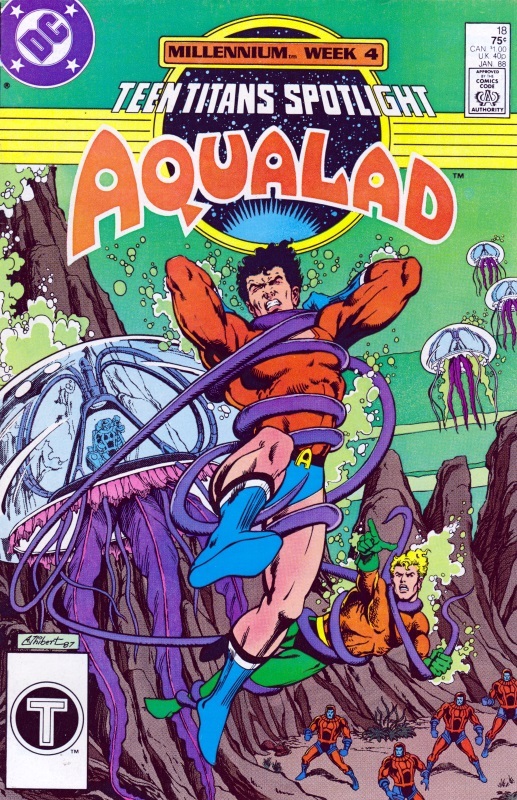 On the brink of defeat, Aqualad allows the “jellysubs” to sting him repeatedly, the attack removing the mental block and allowing him to access his telepathic powers once more. With help from the sea creatures, including the “jellysubs” who are made aware of how the Manhunters have abused them, the heroes defeat the androids and claim the spaceship for themselves. While flying to Louisiana, the Spectre senses a disturbance in Smallville. Investigating, he finds the Superman and the elders of the town mourning the apparent loss of the younger townsfolk who appeared to have died when Superman defeated Dr Whitney in ADVENTURES OF SUPERMAN #436 (as shown in Crossovers Week 3). The Spectre offers to help Superman and sends him into a limbo state where not only Smallville but all the newly-dead youngsters are found. 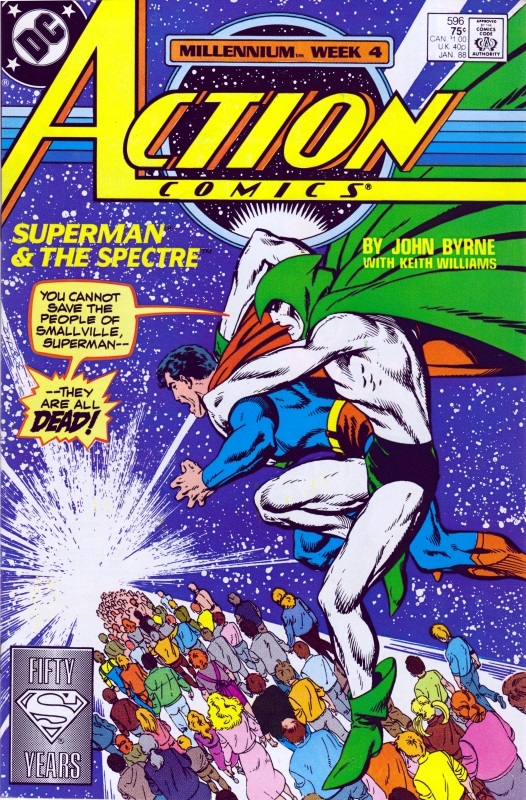 A powerless Superman is almost overcome by the spirit form of Dr Whitney before the Spectre possesses him and forces him to tear himself apart. This releases everyone from their near-dead state, allowing them all to get back to normal with no memory of ever being a Manhunter agent, nor of having known Superman’s secret identity, with the exception of Lana Lang who learned of it before she was controlled by the Manhunters. The next four issues had a crossover within the MILLENNIUM crossover; as they all take place at roughly the same time, it’s hard to put them in a linear order, but the following is my best stab. 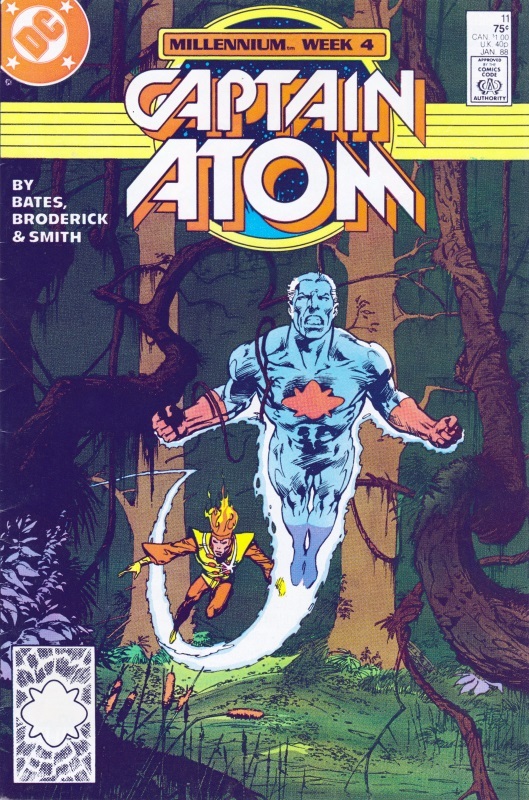 As the Squad find the Manhunter temple in the Louisiana swamp, Captain Atom arrives and offers to help them get their massive bomb as close to the centre of the temple as they can. When their way is blocked by a wall of fire created by Firestorm, Captain Atom volunteers to talks sense in to the young hero. The Squad launch an attack on the temple and Karin Grace is revealed to be a Manhunter agent, along with the Privateer . . . who confuses things by denying involvement. It is revealed Karin had been tricked by an android who arrives and tries to convince her to kill Rick Flag and the Privateer. When all the androids suddenly being to fall apart, Karin tells the privateer to leave with Flag and takes the bomb to the centre of the temple where it explodes, killing her and the android, leaving the Squad to walk home in the snow. Captain Atom confronts Firestorm after the latter had placed a wall of fire around the swamp to stop the heroes approaching the Manhunter temple. Firestorm restrains the Captain who attempts to get through the Manhunter conditioning by telling him about his life and the difficult decisions he’s had to make over the years. Having been briefed by the Manhunters about the Captain, Firestorm refuses to believe him. Elsewhere, Harry Hadley, the Manhunter agent is killed by General Eiling before Hadley can reveal the existence of Project Atom on national television. Captain Atom convinces Firestorm that the Manhunters are evil and, though they are unable to prevent the explosion of the Suicide Squad’s bomb, Firestorm is able t transmute the resulting energy into snow. 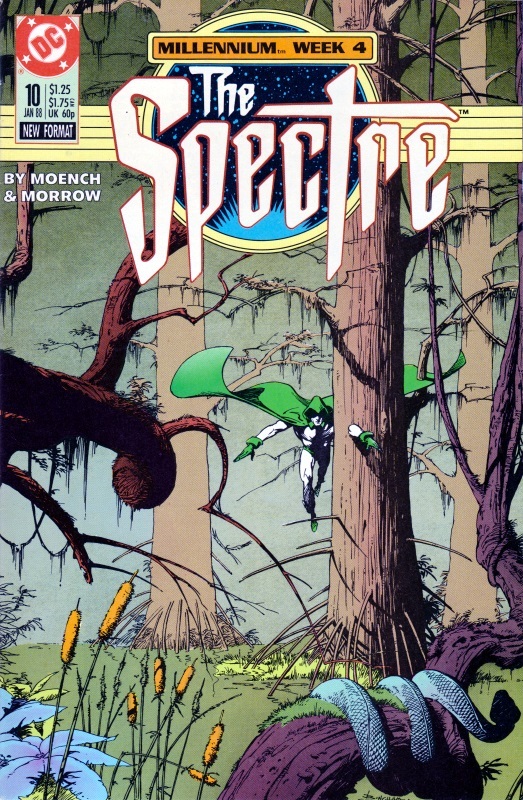 Jim Corrigan and Kim Liang arrive at the Louisiana swamp where the Spectre heads off to try and find the attacker of Madame Xanadu (as seen in MILLENNIUM #4) The Spectre witnesses a Manhunter android abducting civilians and attempts to possess it; instead, he discovers he is able to traverse from one android to another, shutting them down at the same time. Eventually, he makes his way to the central command centre where he is able to shut down all the androids at once, causing them all to fall apart. 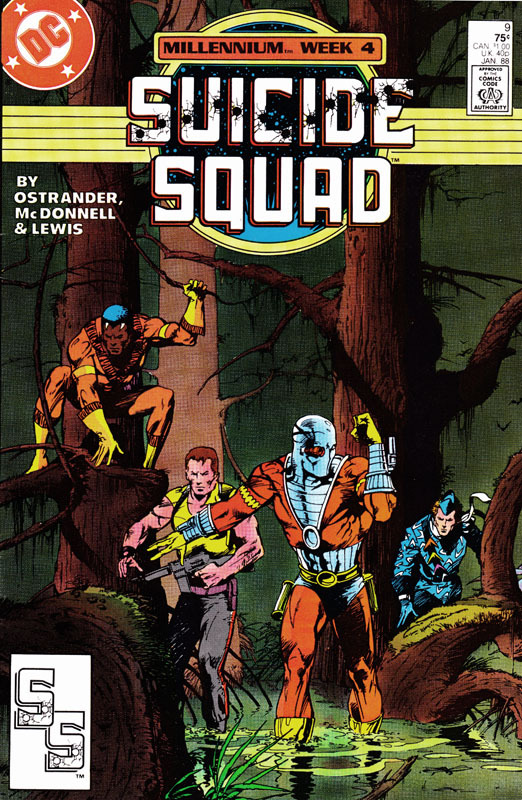 While he hunts, Corrigan finds the Batman investigating the Manhunters and ends up helping him rescue the civilian hostages before the Suicide Squad’s bomb explodes, leaving them all in the swamp as it snows. Commissioner James Gordon heads to Louisiana to meet up with his old Naval Intelligence team, one of whom has asked for his help. It was this trip that allowed the Manhunter android duplicate of Gordon to take his place, as shown in BATMAN #415 in Crossovers Week 2) In disguise, the Batman contacts him and goes with him to meet his old teammate who has stumbled on the Manhunter plot. When an android arrives and mortally wounds Gordon’s friend, Batman heads into town to track down the Manhunters. There, he meets Jim Corrigan and Kim Liang and the pair infiltrate the Manhunter temple. 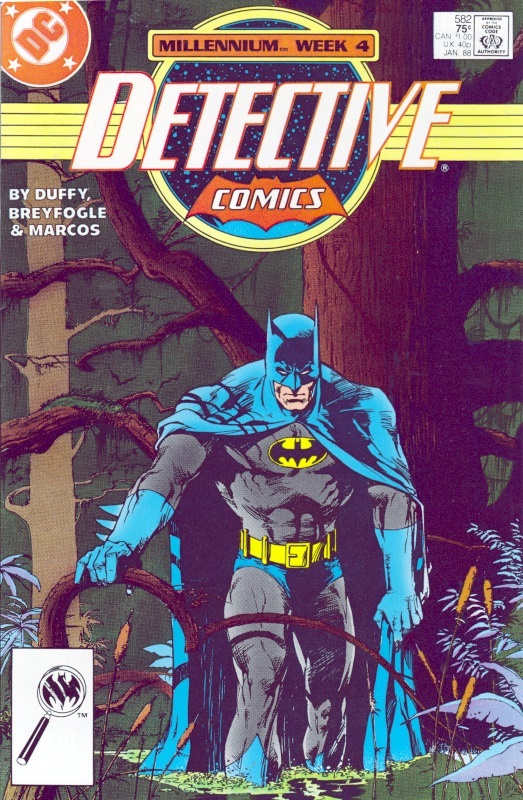 As Corrigan helps free the civilian hostages, Batman confronts Karin Grace on her way to deliver the Suicide Squad’s bomb. As he and Corrigan attempt to escape with the hostages, the Manhunters begin to fall apart thanks to the Spectre’s attack. With the hostages safe, the bomb explodes, leaving everyone walking through the snow.